Ahhh, the joys of Shrink Plastic:) I made these dove badges. I see quite a few people with swallow tattoos on their chests or hoodies with them on and I really like the placement of them. However, I am not quite sure of the meaning behind the swallows. I think it relates back to the Navy. Lots of tattoos and alternative images such as swallows in this placement seem to refer to violence (army, navy, guns, daggers etc) so i wanted to turn that on its head and to doves instead. Doves represent peace and the colour of white makes me think of innocence and purity too. I get asked sometimes why i have doves and its a great opportunity to talk about peace and actively searching for it (hence the green leaf in their mouths that link to the biblical story of Noah's Ark). 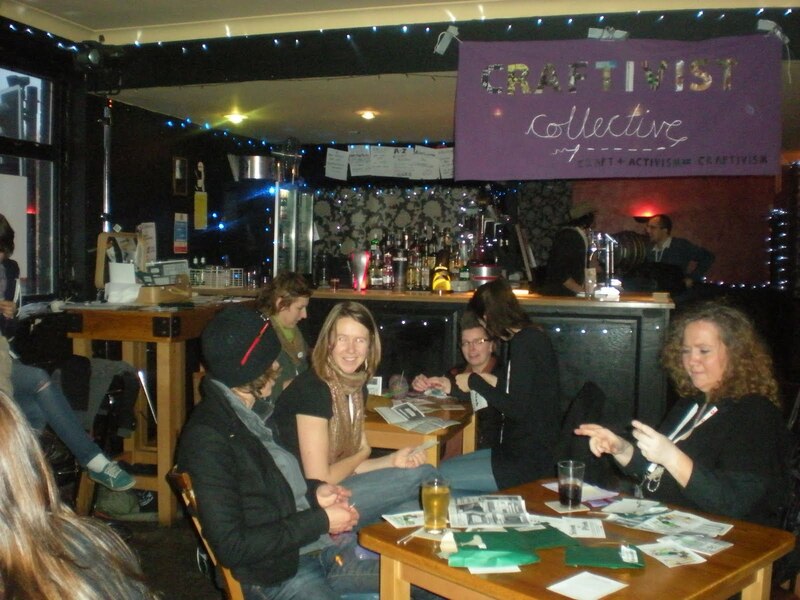 The Craftivist Collective were invited to Sheffield (UK) Doc/Fest 2009 because this year it included lots of documentary films that call for social and political change and demand action (e.g. the films: Guilty Pleasures, The Cove, Rough Aunties, A Time Comes and more). As well as showing many films, a lot of what Doc/Fest is about is finding distributors and funders for film projects (features and shorts) so there is a lot of networking 'sessions' that happen around Sheffield for this reason. Doc/Fest decided to do a 'Stitch and Pitch' networking session and thought we would be perfect for this. We made bespoke Mini Protest Banner Kits with slogans that linked to some of the political films and asked people to make these banners and hang them around Sheffield to encourage people to think about such issues as corruption, slave labour, human rights issues, environmental damage and animal rights. We started this group in January 2009 and it's quickly growing in members and group ideas. We have changed the format a few times of the group (now we have planning meetings monthly and then separate events rather than all in the one session), added a manifesto and we are getting asked to do more and more events. Here's what we're doing to get info to you in as many ways as possible. On Saturday 3rd October the Craftivist Collective had a Mini Protest Banner making workshop at Spitalfields City Farm in London. We spent 12-2pm chilling out surrounded by plants and animals whilst chatting to like-minded people and creating our own mini protest banners on environmental issues to put up around the farm... what more could you want to do! This project was done by a young person who went to Ghana with Platform2 as a volunteer. She spoke to me about how many of the girls born in the village (she stayed for 10 weeks) thought they were not beautiful because they were not blonde with blue eyes. She found this very upsetting especially because that volunteer was very dark skinned herself. 02 Oct The amazing Manchester Sugar Paper zinesters like us – yay!